Weight – 250 lbs., (transformed) 500 lbs. Powers – Colossus can transform his body tissue into an organic, steel-like substance that grants him superhuman strength enabling him to lift/press up to 75 tons and makes him impervious to most injury. His armored form can withstand ballistic penetration as well as temperature extremes from 70º above absolute zero (-390º F) to approximately 9000º F. Colossus cannot become partially or selectively armored; his body is either entirely converted, or not at all. Even his eyes become steel-like. 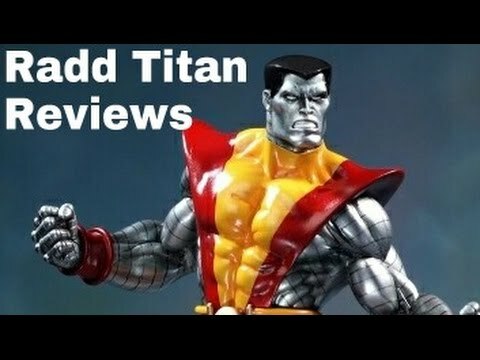 Through an act of will, Colossus can transform virtually instantaneously into his armored state, and can remain in that form for an as yet undetermined amount of time. Once in his armored form, Colossus remains so until he consciously wills himself back to normal. If he is rendered unconscious, however, he spontaneously reverts to his normal form. In his armored state, Colossus retains his normal human mobility, though his endurance and speed are enhanced. He does not need to breathe while transformed, but it is believed that he could not survive for long in a vacuum. Abilities – Colossus is talented in drawing and painting.